So I've had a really annoying first trimester.... some days weren't too bad, but for the most part I just didn't know what to eat because I would find something I could keep down but that would only last a few days before my gag reflex adjusted to it and kicked in. But I can't complain too much. Honestly I don't think I had it that bad. People took my shifts when I was really too sick to work and by the time school had started I'd figured things out enough to at least make it to class. As for school, I only even threw up one time in the school bathroom... which was a really bad one, but at least it wasn't a regular occurrence. 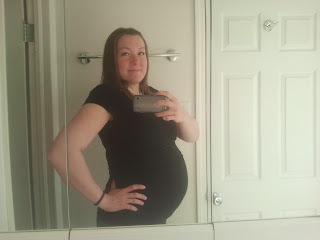 It is crazy that I'm already entering the 2nd trimester because it is still hard to believe I'm really pregnant! It is more real to me because of the ultrasound we got to see, but I can't wait for my belly to be a baby belly instead of what looks like the effects of a large lunch. I'm also anxious to find out what kind of baby we're going to have! My sister Shay just found out she's having a boy which follows the trend of our family and now I'm anxious to know too. The only thing is, it is hard to think of this baby as not being a boy! Ever since we found out I was pregnant Tyler's been calling it a boy. 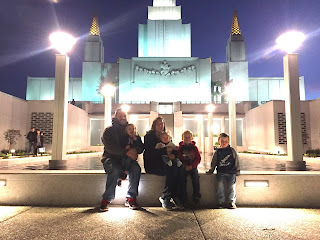 He says we have to be the trend breakers because his brother has had 3 girls and 0 boys, and both my brother and sister started out with a girl. So from the start he could be found talking to my belly saying "hello baby, you're going to be a boy, ok?" or, "hey there baby BOY!" and other similar things... like he thinks that will influence the gender somehow. Well according to biology that's not possible but with Tyler always referring to it as a"him"... it sure has influenced my thinking. I catch myself almost calling our little mystery baby a boy in conversation and I have to add "or her" really fast. I'm not partial either way, but it just doesn't feel possible for it to be a girl. Besides, think how cute it would be to have Grant, Shay and Brad's baby boy, and mine be like 3 little musketeers... hopefully they are more like musketeers than mischievous devils. On the other hand, I'm sure a little girl would make a great playmate with Aleah and Emma. Like I said, I'm not biased.... just brainwashed. So exciting! I know how you feel with being sick at school. I actually puked in the hall trying to get to the bathroom and I had to clean it up. Hope your second trimester is better for you! I hope that you do break the trend. It will be fun either way, but I am excited to find out what you are having!